But here's a trailer and some images to agonize over. Over the weekend at the geek fan mecca known as San Diego Comic Con, the cast and crew of The Walking Dead gathered for a panel at Hall H in which nobody was able to say a damn thing about the upcoming season. When we last left AMC's hit zombie drama, one of our beloved survivors was getting beaten to death by the villainous Negan in a moment that fans had been anticipating and dreading for some time. 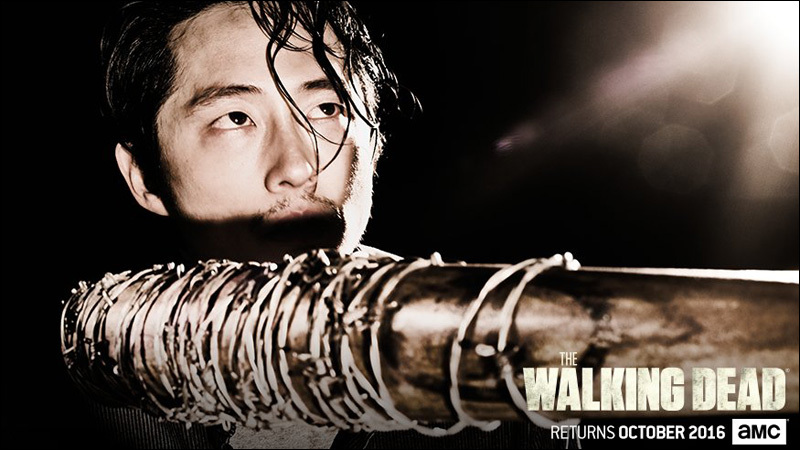 The season ended on the cruelest of cliffhangers, with most of the core characters -- including Glenn, played by Steven Yeun -- on the possible receiving end of Negan's barbed wire-covered baseball bat. Yes, there is a strong possibility that it's Glenn, if the show chooses to remain faithful to The Walking Dead comic book's most infamous moment. If you're like me, you're praying to the TV deities that this fate would befall someone, anyone else besides our favorite Asian American zombie apocalypse survivor. But the show's panelists remained tight-lipped, talking about the show in broad strokes out of fear of giving away anything. They did unveil the Season 7 Comic-Con trailer, which reminds everybody that our heroes are in a pretty bad situation, before revealing some non-Negan-related footage from season seven. The show also unloaded a bunch of disturbing new character posters last week in anticipation of Comic-Con. Oh, this cruel show. At this point, I almost don't even want to know. But we'll find out when season seven of The Walking Dead premieres on October 23 on AMC. Our long summer continues.